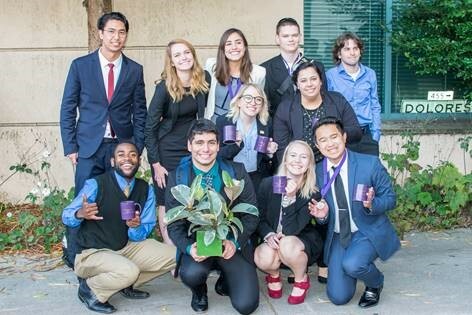 (MODESTO, CA)— The Modesto Junior College Speech and Debate team started the competitive season by winning a First Place Sweepstakes Award at the Golden Gate Opener held September 22-24, 2017 at San Francisco State University. The competition was a “swing,” meaning there are two full tournaments over the course of the weekend and competitors have the chance to win in their events twice. Competing against two-year and four-year institutions, 11 MJC students participated and by the end of the weekend MJC collected 24 awards, including several in individual speech events. MJC’s results from the first tournament are as follows: In Open After Dinner Speaking, Austin Castro earned a finalist award; in Open Communication Analysis, Bailey Coleman took third place; in Open Informative Speaking, Coleman won second place; in Open Impromptu, Castro brought home a finalist award; in Novice Impromptu, Sabrinna Gonzales and Kaylee Inman earned finalist awards and Taylor Coburn won second place, and in Novice Persuasion, Jordain Johnson earned a finalist award, Coburn took second place and Gonzales won first place. The results from the second tournament are as follows: In Open After Dinner Speaking, Castro earned a finalist award; in Open Communication Analysis, Coleman won third place; in Open Informative Speaking, Coleman took Top Non-Advancing Novice; in Open Impromptu, Castro brought home the second-place award; in Novice Impromptu, Gonzales and Coburn took finalist awards while Inman captured first place; in Novice Persuasion, Gonzales earned a finalist award, Johnson took second place and Coburn won first place, and in Novice Poetry, Justin Dolenar won second place. In debate events, MJC students also performed well. In Novice Parliamentary Debate, first-semester students Zoe Diebeck and Lydia Sanabria brought home the first place award. In Junior Parliamentary Debate, Inman and her hybrid partner from Ohlone Community College also won first place. MJC students were also recognized as some of the best speakers at the tournament. This is calculated separately from wins and losses and instead reflects students’ speaker points in each round. In Novice Parliamentary Debate, Sanabria was recognized as the seventh best speaker while Diebeck earned top speaker. In Junior Lincoln-Douglas Debate, Brendan Ward was recognized as the fourth-best speaker. On October 6-7, MJC forensics will travel to Santa Rosa, CA for another round of competition. A photo is attached for media use and IDs are given below.